This is a scheduled post, be back soon! Said Viola in Shakespeare’s Twelth Night, I’d like this one please. 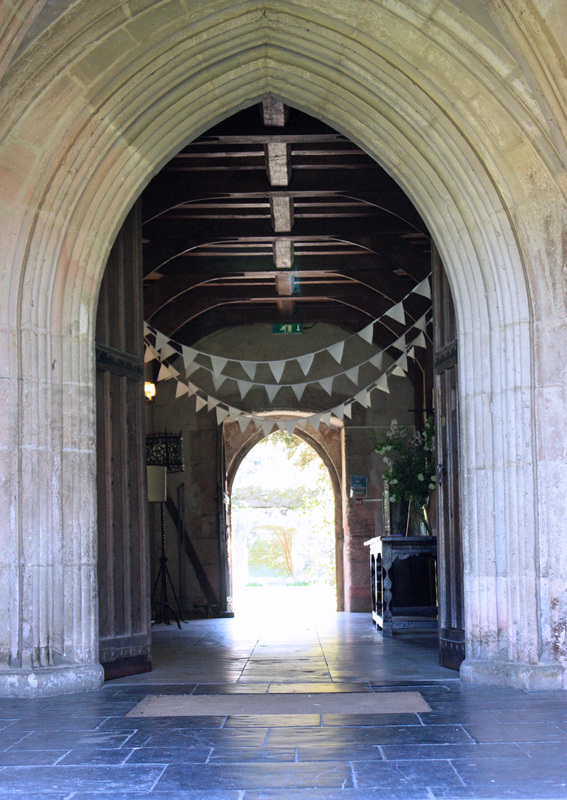 It was a new addition at Dartington when I went for my birthday and I fell in love with it, who wouldn’t? I don’t know if it is staying there, willow has a life of perhaps ten years but they often have artwork visiting for just a few weeks. Today is my birthday and I’ve had a three day weekend of fun with family and friends. On friday I went to Cockington Court and Dartington and I thought I’d show you some of the flowers I saw, enjoy! Perhaps you can help name the mystery flowers? The photo I have chosen shows someone escaping into meditation, I wonder where he went. Join in at http://dailypost.wordpress.com/2013/05/17/photo-challenge-escape/ as usual. Elisa at http://autumninbruges.wordpress.com/2012/12/08/music-in-pictures-contest-love-is-all-around/ is back with a bang and a dream of a song this week. I’ve always liked this sculpture of two swans embracing in Dartington hall garden, hope you like it too. I wanted to try something different, so I’ve cropped quite a bit of non blue from this shot. It’s Dartington again, my second photo from there this week. Earlier in the year they featured some children’s artwork in the garden, it was lovely to see it gently swirling in the breeze. This is what CBBH is all about! Marianne says ‘On the first day of each month, I will provide a theme to inspire you to post your own interpretation. Create your own blog post before the end of the month and entitle it “CBBH Photo Challenge: (subject of the month)”, providing a link to this blog so I´ll know you´re participating, and others can find it, too. At first glance this may not seem to fit the challenge but if you read down Elisa’s post you will see that the song ‘talks about life and how we need to give something of ourselves to others to make it worth’. 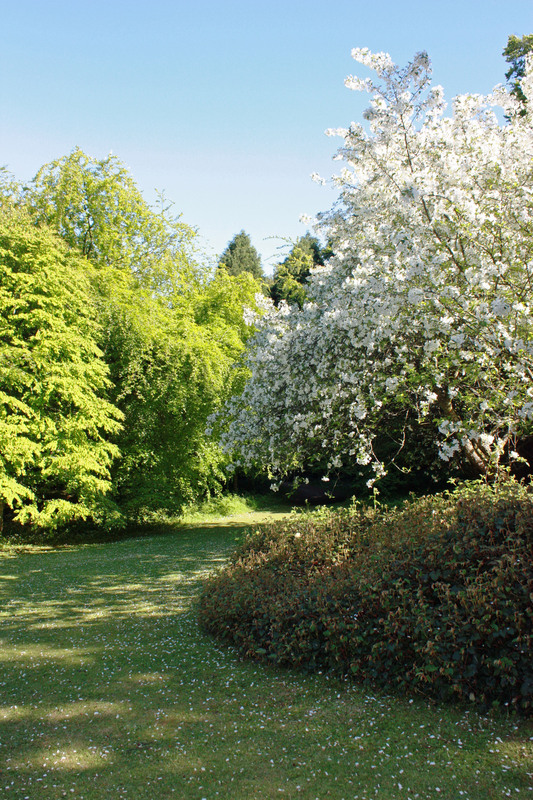 The Dartington estate was created by the Elmhirst family and is now held in trust for all to enjoy its beauty. 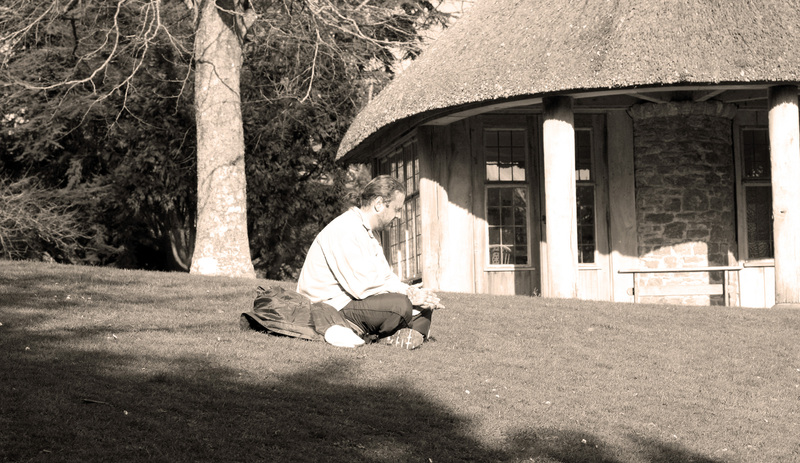 As soon as I saw this weeks challenge I remembered this photo, taken in the ground of Dartington Hall in Devon. 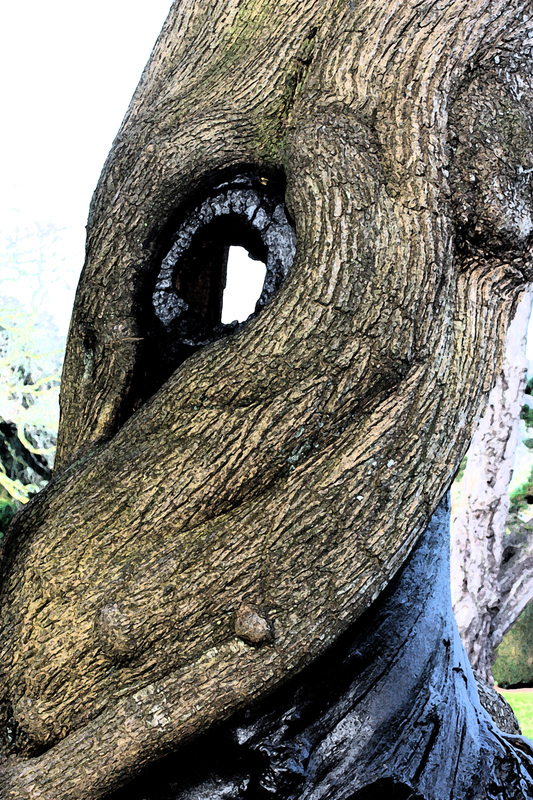 I believe the large and very old tree was struck by lightning and that the dark stuff is applied to protect its insides. It seems to have saved it thank goodness, because it’s in a row and it would be a huge loss. As well as its own twists and turns I have fresco’d it with Photoshop.